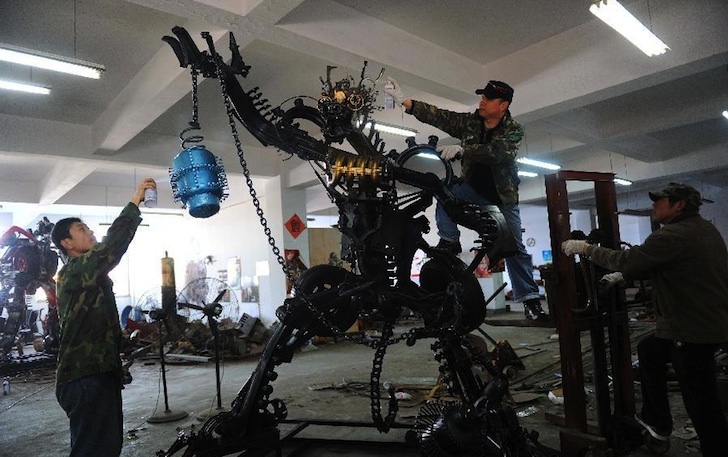 Chinese artist Zhu Kefeng unites public spectacle with environmental stewardship as he realizes his dream of building a Transformers-inspired theme park entirely from scrap metals. 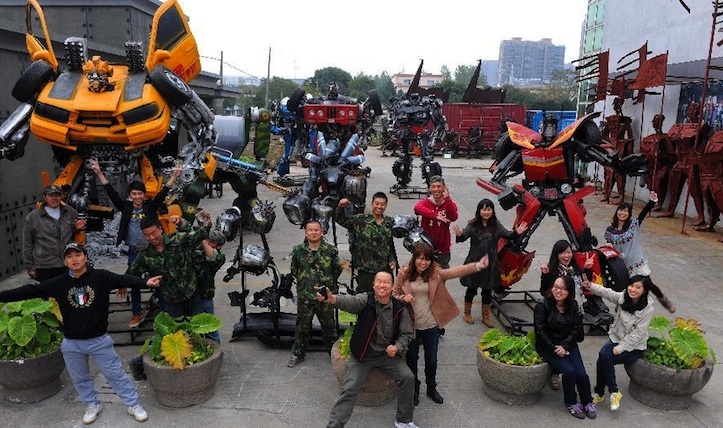 <a href="http://en.wikipedia.org/wiki/Transformers_(film)">Transformers</a> is the seventh-highest grossing film of all time, and capitalizing on this craze with recycled metal models is nothing new for China. In the past we've covered the <a href="https://inhabitat.com/incredible-scrap-metal-transformers-robots-look-just-like-in-the-movies/" target="_blank">Legend of Iron</a> project, a <a href="https://inhabitat.com/chinese-designers-build-5-ton-transformers-megatron-tank-from-scrap-metal/" target="_blank">5-ton megamachine</a>, and even a <a href="https://inhabitat.com/solar-powered-transformer-robot-is-our-kind-of-autobot/" target="_blank">solar-powered version</a>, but 49-year old Zhu Kefeng's Mr. Iron Robot theme park adds much appreciated depth to the cultural phenomenon. Flip through the slideshow to see what's bringing hordes of film fans to the site! Zhu has been working on Mr. Iron Robot theme park for over a decade. The park features 600 Transformer-like sculptures. 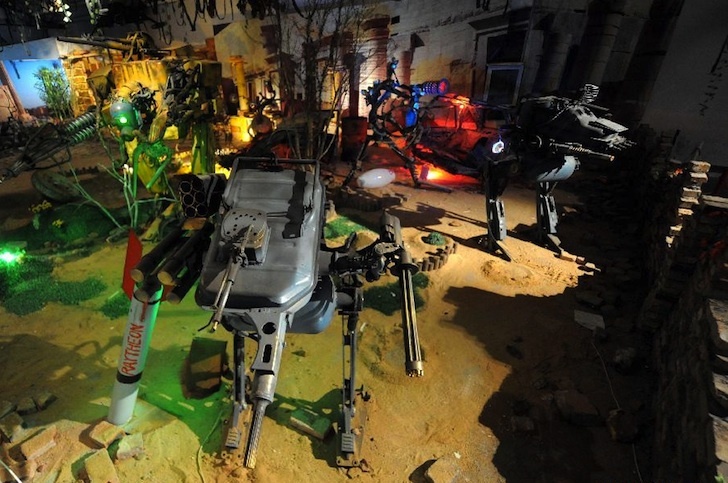 Each one--some more than ten feet tall--was assembled with parts <a href="https://inhabitat.com/nine-stories-reclaimed-car-steel-tables/" target="_blank">salvaged from old vehicles</a> and machine tools. The former factory features heavy favorites like Optimus Prime, Bumblebee and Megatron as well as <a href="https://inhabitat.com/cambodias-new-stock-exchange-tower-has-dragon-scales/" target="_blank">dragons</a> and cartoon figures. It has been very popular with the kids Zhu told <a href="http://news.xinhuanet.com/english/photo/2012-03/27/c_131493025_2.htm" target="_blank">Xinhuanet</a>, "I feel very glad when the children visit my park and enjoy the happiness here. I still remember the joy when I play iron toys in my childhood…Joy shared with others are more enjoyed." Zhu and his team spent ten years making <a href="https://inhabitat.com/peter-legrand-turns-recycled-materials-into-useful-bike-trailers-in-chicago/" target="_blank">recycled iron</a> and steel sculptures, and will continue to create new structures for the theme park and for commission. Before Zhu had the 225-hectare abandoned factory, he was making models on a smaller scale. 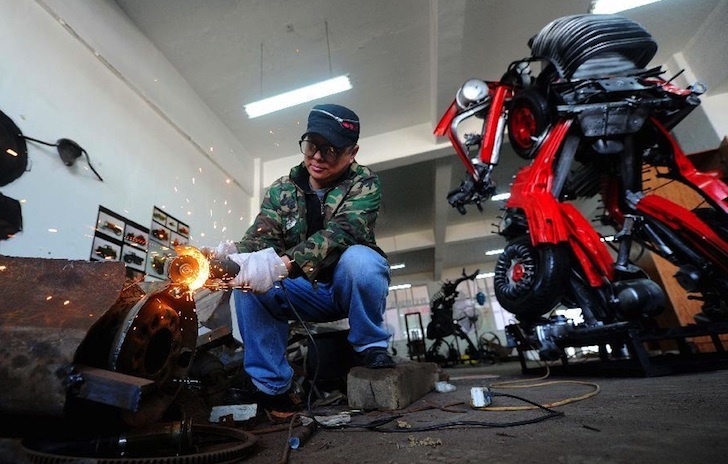 After distributing large recycle bins for iron and steel materials, Zhu was able to collect enough scrap metals to expand his operation and add new features to his work. Zhu began to build the theme park in 2010 with money he had put aside from selling his sculptures on commission and from selling his own apartment in Shanghai. Living his dream has been well worth it. 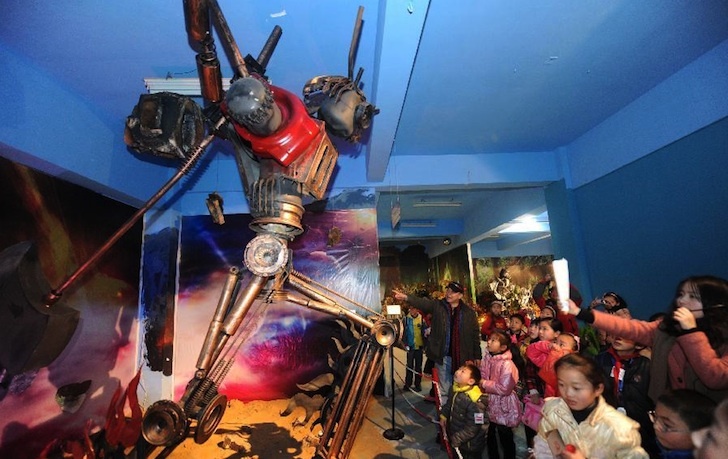 Just last week, Mr. Iron Robot theme park in Jiazing City was granted status as a tourist attraction on March 20, 2012 meaning that Zhu has successfully built China's first park themed on <a href="https://inhabitat.com/jose-riveras-ice-cream-bike-turns-recycled-parts-into-a-delectable-ride/" target="_blank">recycled iron and steel</a> artworks. As China moves through the automobile era a <a href="https://inhabitat.com/paradise-parking-vintage-cars-are-swallowed-up-by-trees-and-vines-in-france/peter-lippmann-paradise-parking-3/" target="_blank">trail of wasted cars</a> collects in its wake. The Mr. Iron Robot theme park provides visitors with that sense of joy and happiness Zhu mentioned, but it also invokes a strong spirit of <a href="https://inhabitat.com/more-than-30-million-people-in-china-live-in-eco-friendly-caves/" target="_blank">green development</a> and environmental stewardship. Alongside the sculptures is a gallery displaying human civilization from the Stone Age to the 21st century. A truly eccentric collection of interests and passions that make this sustainably-minded Transformer-inspired theme park one for the ages. 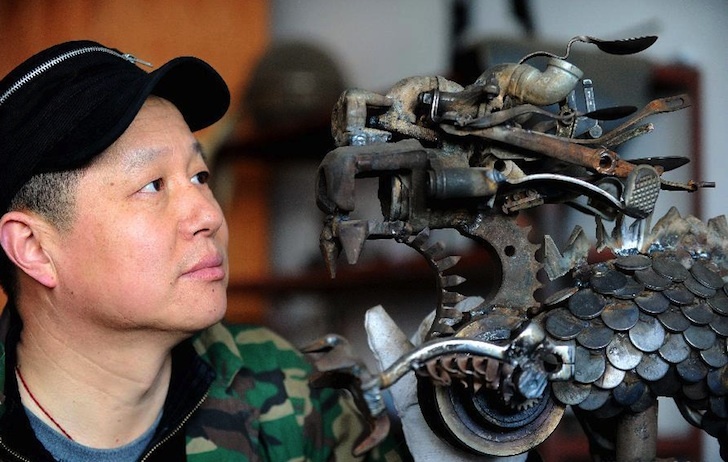 Chinese artist Zhu Kefeng unites public spectacle with environmental stewardship as he realizes his dream of building a Transformers-inspired theme park entirely from scrap metals. 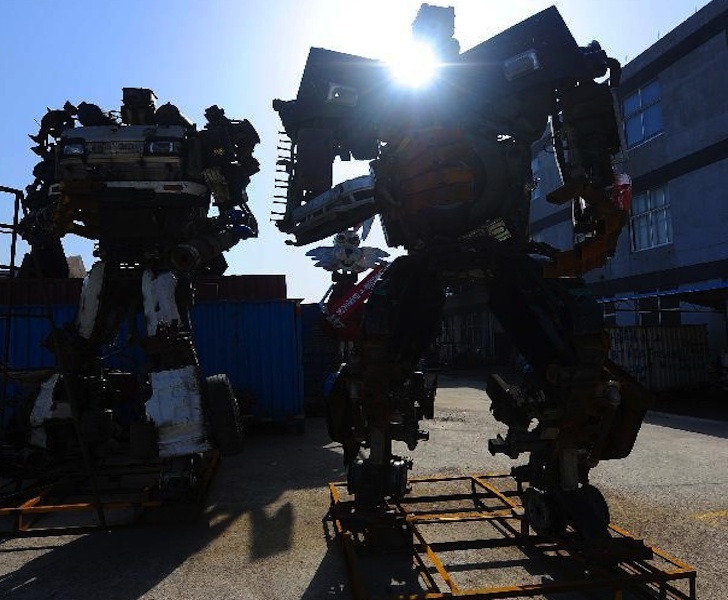 Transformers is the seventh-highest grossing film of all time, and capitalizing on this craze with recycled metal models is nothing new for China. 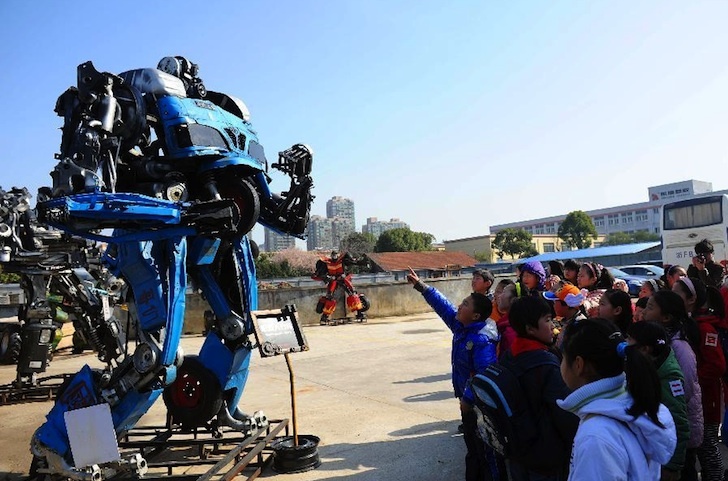 In the past we've covered the Legend of Iron project, a 5-ton megamachine, and even a solar-powered version, but 49-year old Zhu Kefeng's Mr. Iron Robot theme park adds much appreciated depth to the cultural phenomenon. Flip through the slideshow to see what's bringing hordes of film fans to the site!